NEW YORK (Reuters) - U.S. stocks just wrapped up their best quarter in nearly a decade, coming within a stone's throw of a record high. "We think this cycle has a lot more time than (others) think," said Krishna Memani, chief investment officer at Oppenheimer Funds. "It's not ending in 2019 and it's not ending in 2020. It has a few more years to go." In the current case, the high-yield index has been striking new tops since early February. Meanwhile, the S&P, up 22% from its December low, is about 2% short of last fall's record and the Russell 2000, the benchmark for small-cap stocks, is around 10% below its high-water mark. Of even greater importance for stocks and high-yield bonds, the outlook for corporate profits - the fundamental driver in both markets - is weakening. S&P companies' earnings may have fallen in the first quarter for the first time since 2016, according to Refinitiv data, and full-year 2019 profit growth is seen as less than half the pace of 2018's tax-cut fuelled pace. 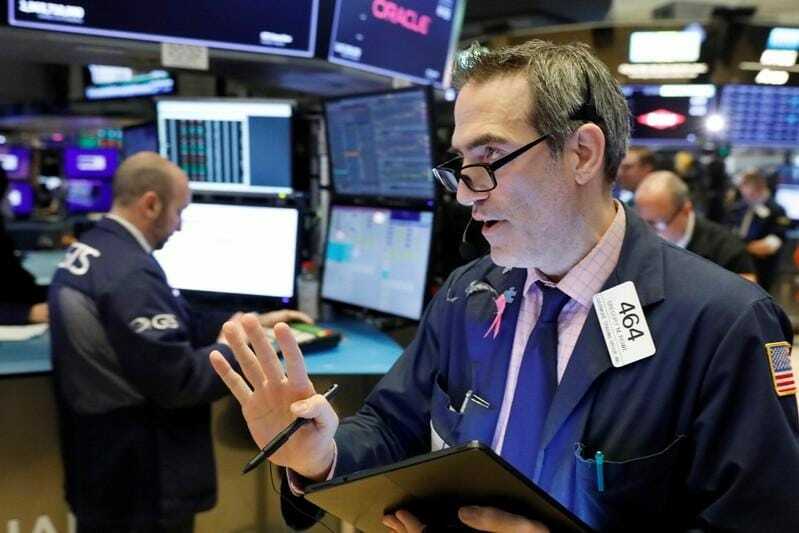 "While the economic data is coming across as mixed, the market and investors are willing to give it the benefit of the doubt," said Lale Topcuoglu, senior fund manager at J O Hambro Capital Management Group in New York. "Both (credit and equity) markets are getting onto this weird cycle where they're pointing fingers at each other in the absence of any economic news." Still, equity markets are flashing green, and market volatility, which rises when investors are anxious, is not far off last fall's lows when stocks were last at a record. "I'm worried that the high-yield market is a bit overpriced," he said. "Having said that, I'm still pretty confident about stock prices for the rest of the year." Even when 3-month Treasury yields briefly overtook 10-year rates, junk bond spreads remained relatively narrow. That also shows investors aren't overly worried, said Keith Lerner, chief market strategist at SunTrust Advisory Services in Atlanta. With spreads continuing to tighten, keep an eye on financial stocks in particular, said Jim Paulsen, chief investment strategist at the Leuthold Group in Minneapolis. Spreads and the total return of the S&P 500 Financials index are closely correlated, but financials have not yet fully recovered from December's rout even as junk bonds have made new highs. "There's some catch-up room in those stocks relative to what credit spreads are already saying," he said.